Each year we are lucky to be allowed to return to Athelhampton House for our big charity fund raising event and we again thank Patrick and Andrea Cooke for hosting us. The setup started on Saturday afternoon, we were very lucky to have fantastic numbers of members turn out to help. We set up all our gazebos and event shelters in a record time of just over one hour. Early Sunday morning we arrived to dress the stalls in readiness for our 10.00 am opening. A steady line of cars kept the gate crew busy taking entry fees and directing cars to their parking area where our marshals parked them in neat lines. 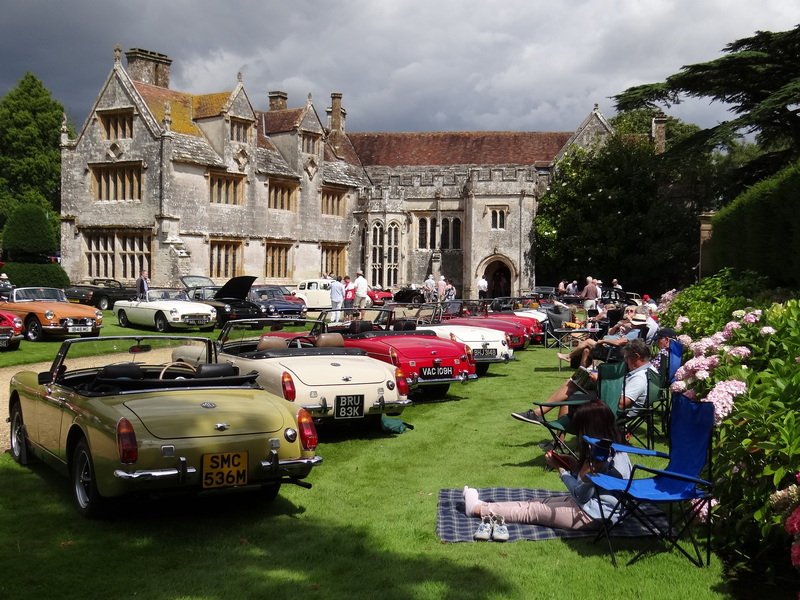 140 cars arrived and parked on the front and rear lawns of this historic house, the weather was good and the music from the New Forest Dixieland Band was again very much enjoyed. The now traditional Duck Race was won by Peter Chance who donated his prize to our charity fund. Car of the day was won by Alex Garvey with his Jubilee MGB GT, the furthest travelled award went to Angela Magee from High Wycombe MGOC and Mary Lou Ball won the Name the Dog competition with 'Jazz'. This year we raised £1665 on the day for our charities which we intend the round up to £2000, providing both Macmillan Caring Locally and the Dorset and Somerset Air Ambulance with £1000.00 each. I thank all those who helped run the event for their hard work and of course our visitors on the day. Athelhampton 2018 is already booked for Sunday 12th August. make a note in your diaries.